MOSCOW - The massive Red Square parade, once a Soviet standard, enjoyed a revival yesterday as more than 100 military vehicles, including ballistic missile launchers, rumbled over paving stones to deliver a loud message: The bear is back. Moscow has not seen a show of weapons on this scale since 1990, when the Soviets last commemorated the 1917 Bolshevik Revolution. Within a year the Soviet Union was no more. 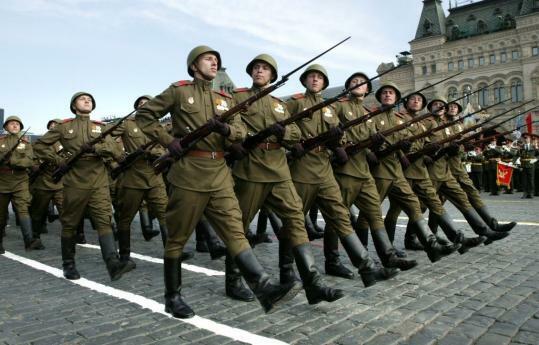 Since the mid-1990s, Russians have celebrated victory in World War II with a parade on May 9. But those festivities did not include displays of weaponry until this year, the 63d anniversary of the defeat of Nazi Germany. Eight thousand goose-stepping troops, wearing newly designed uniforms, as well as tanks, armored vehicles, and missiles crossed the square yesterday. Overhead, strategic bombers and fighter planes roared across the sky. President Dmitry Medvedev, presiding over his first public ceremony, said Russia's military is "gaining in strength and power like all of Russia." And drawing from the playbook used by his predecessor, Vladimir Putin, who stood beside him, Medvedev appeared to criticize the United States without actually naming the country. "We must not allow contempt for the norms of international law," he said, warning against "intentions to intrude in the affairs of other states and especially redraw borders." Russia has consistently opposed the US-led war in Iraq as a violation of international law. Most recently, it criticized Kosovo's declaration of independence from Serbia, which the United States supported. "The history of world wars warns us that armed conflicts do not erupt on their own," said Medvedev. "They are fueled by those whose irresponsible ambitions overpower the interests of countries and whole continents, the interests of millions of people." At last year's parade, Putin appeared to compare the United States to Nazi Germany. The Kremlin later denied that was his intention. Putin, now prime minister, and Medvedev watched the parade from a reviewing stand - unlike Soviet leaders who used to stand on top of the mausoleum containing the mummified body of Vladimir Lenin, the first Soviet leader. "This isn't saber rattling," said Putin, speaking earlier this week about the parade. "We're not threatening anyone and we don't plan to do so. We're not imposing anything on anyone. We have enough of everything. This is a demonstration of our growing potential in the area of defense." About 70 percent of Russians support the return of military hardware to Red Square, according to opinion polls here. "The parade demonstrates that should anything happen we will be able to beat any enemy," said Elena Volkova, an 86-year-old retired schoolteacher who celebrated Victory Day in a Moscow park. "Our military is respected again. And the West envies Russia and the Russian people because Putin was able to restore the country after such a deep collapse in the 1990s." Under Putin, annual defense spending has increased eight-fold to $40 billion. Russia has resumed long-range bomber patrols, which have buzzed US ships in the Pacific and forced NATO jets to scramble around Western Europe. And it has threatened to target missiles at Ukraine, Poland, and the Czech Republic in response to the expansion of NATO and US plans to station a missile defense system in Central Europe. "Russia wants to create an impression of might, the revival of might, and the return of the Soviet-style parade is part of that," said Alexander Khramchihin, of the Institute for Political and Military Analysis in Moscow. Putin also restored the music from the Soviet anthem. But for all the martial posturing, the Russian military cannot be compared to its Soviet predecessor. The military is accused of waste and corruption that has prevented it from a large-scale modernization. And the army is regarded as such a bastion of brutality and hazing that most young Russian men try to avoid conscription. A Pentagon spokesman earlier this week derisively dismissed the display of military power. "If they wish to take out their old equipment and take it for a spin and check it out, they're more than welcome to do so," said Geoff Morrell, Pentagon press secretary. But many Russians, nostalgic for lost greatness and proud of Putin's efforts to restore it, dismiss such remarks as nothing more than foreign resentment. A major energy exporter, Russia is flush with revenues from oil and gas sales, and the government has pledged to continue increasing spending on defense. "The US doesn't like it that Russia has become more powerful," said Zoya Khmyryova, 59, who was celebrating Victory Day yesterday. "The parade shows the might of our country."